Heat grill to medium-high. In a large bowl, combine oil and lemon juice; season dressing with salt and pepper. Lay chicken flat. Holding a sharp knife parallel to work surface, split each chicken breast in half horizontally. Cover with plastic wrap and pound each piece with the flat side of a meat mallet or the bottom of a small pan until inch thick. Drizzle with 2 tablespoons dressing and sprinkle with cumin. Clean and oil grill. Grill chicken until cooked through, 1 to 2 minutes per side. To bowl with dressing, add watercress, radishes, and avocado and toss to combine. 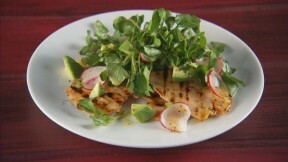 Serve chicken topped with watercress salad.